You might not think of orange when you start planning the decor in your house as it is a very vibrant colour that can easily overpower the rest of your furnishings. 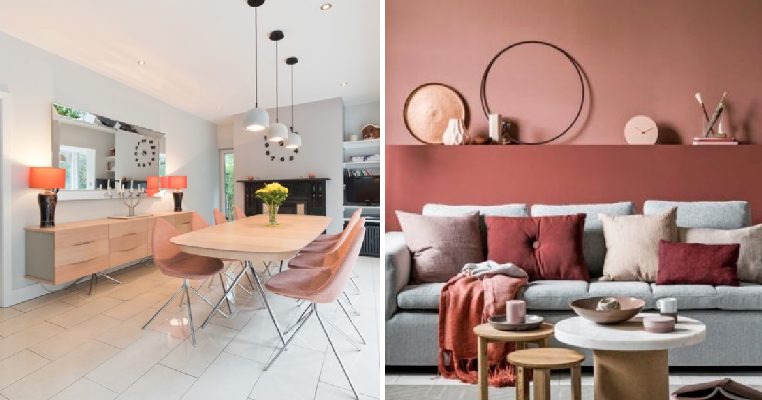 However, orange comes in many shades such as apricot, salmon and terracotta, which are softer and perfect to give your home a stylish feel so read on to find out more. Before you freak out, consider this living room that has shades of tangerine, salmon and terracotta around that instantly gives it a welcoming feel. Paired with grey and some sage green, it looks modern and warm, which is what you want a living room to be. A simple dining room is transformed into one filled with warmth thanks to the liberal use of shades of orange for the outstanding lamps and chairs. This is offset by the white palette used on the walls and floors while the wooden dining table adds a crowning touch. Create a beautifully chic bedroom with shades of orange like this example here, that looks really comfy and cosy. In here, orange is used as part of patterns which gives it a trendy appeal and matches the walls as well. You know what they say, orange is the new black and in this kitchen, it simply shines as shades of orange such as apricot is used predominantly. The kitchen island and cabinet are painted the same shade which goes well with the patterned backsplash and black bar stools. This is another example of a stylish living room dressed up in muted shades of orange such as brick to give it a very homey feel. Many of the decor items use shades of this colour interspersed by grey and cream that allows the orange to shine through.